Veteran’s day proved to be a very good shopping day for the Mister and I. After Scott got a few hours of homework in in the am we headed out to get a few things. The only "new" item we purchased yesterday was a wedding band. 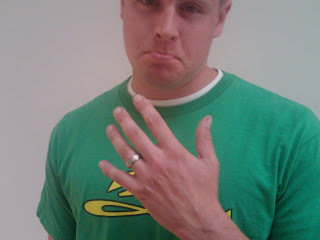 Yes, I know, almost 7 months after being married we just now got Scott a ring. I had been debating back and forth on whether or not to wait until June to get him a ring, but the more I thought about it, the more I wanted him to wear one now! I mean, hey I wear my bling on my finger so the world knows I’m taken, and he should do the same! I think this picture says it all! After a quick trip to Scott’s base (He works on one and I work on the other so one is his and one is mine) to pick up his uniform we stopped at the library. I found 6 books for a whopping $4! Score. I love love love books and getting 6 for the price of less than one is always a major plus. I am really going to try and only buy used books. I love also getting them on Amazon.com, they sell for like 25 cents and then you pay a few dollars in shipping, still about a fourth of the price of buying it new. Scott and I decided for Christmas we were going to buy furniture. Not just any kind of furniture, but something that we absolutely love, and that is not made of particle board and or from Ikea, like 95% of our house. We found an amazing antique/used furniture store in downtown V town and have perused it a few times. We went yesterday to see if any of the pieces matched our vision. Initially we had talked about getting a hutch to used as both a book shelf and a wine bar area. We found a few pieces but nothing that screamed “buy me”. We did, however, find two pieces that screamed buy me and they will work beautifully together to fit our needs. One is a “lawyer bookcase,” you know, those amazing bookshelves that have the glass doors that open up, like a garage door, and a piece that is from 1900 hundred that will be perfect for our wine bar area! I couldn’t wait for us to get a truck and bring them home to take pictures, so here they are, still in the store. We ended our used shopping day at a consignment store…I got a few amazing items, which I will show all of you in my next post, devoted to awesome deals on second hand clothes…my new found love! Way to put a ring on 'im! ;-) Can't believe the great book prices that you found! I LOVE buying books (makes me want to run to a book store like now) but I have a whole stack at home waiting to be read. Hope you have a great weekend!